Gymshark has grown to one of the most-recognizable brands in fitness. New to the Awin US network, we asked them to share practices for a successful holiday season. Created in 2012 by teenager Ben Francis and a group of his high school friends, Gymshark is a global fitness apparel and accessories brand, manufacturer & online retailer. Initially launching in a garage as a screen printing company, it has grown to one of the fastest-growing and most-recognizable brands in fitness. How big of an event is Black Friday for Gymshark in the U.S.? What impact has the event had on your business in previous years? Our existing customers went crazy for our Black Friday sale last year, spending very highly and purchasing multiple items. New customers really bought into the sale as well, and we have seen them continue to buy with us. The biggest benefit for us was that when a new customer found us they kept on coming back. As a brand we only have two sales a year. Customers know this is the time to buy if they want a discount. Additionally, we predict affiliate marketing will drive triple what it did last year; big, big, commissions for affiliates involved! 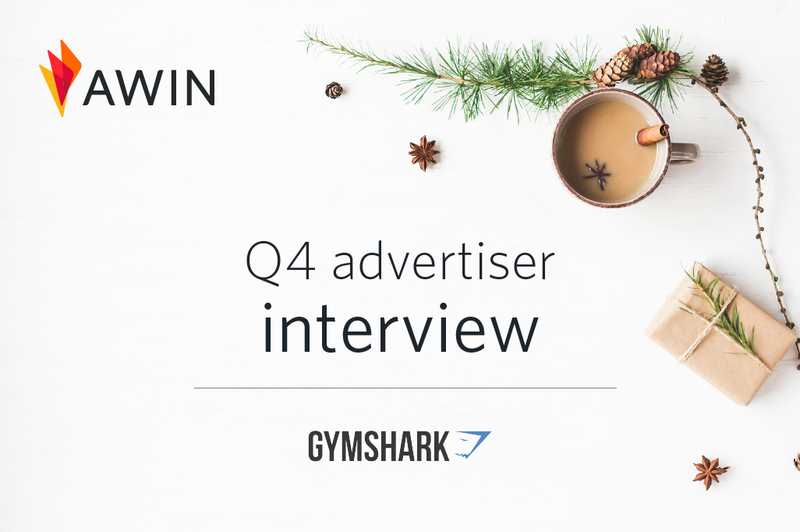 What are some benefits for affiliates working with your brand in Q4? We are the most-exciting brand in the athleisure space right now and our industry is very young. Investing with us in Q4 will afford our partners support on how to capture traffic and rank highly on search engines before the industry becomes saturated. What are some of your best practices for engaging affiliates/users during Q4? Competitive CPA and telling them how to reach our customer. Nothing is more important to us than educating partners on how to reach our consumer, and then how to convert them into a sale. How does Awin play a role in your Q4 success? Awin provides all the support we need to ensure partners get a fair opportunity to promote us and are compensated in a competitive manner. We have kept exclusives to a minimum so everyone has a chance to win, and Awin has advised on very well in this area. You don’t need to be a level 99 developer to understand it. Everything is common-sense based, which you don’t get from a lot of platforms. To learn more about Gymshark, and how to join their affiliate program, please click here.